My inspiration for asking my adult students to write about their swimming experiences came from reading an article in the Wall Street Journal. The journalist had interviewed me for the piece on adults learning to swim, but nothing of real value that I had shared was conveyed in the final article, which you can find at this site. After hearing about some of the unbelievable challenges my mature students had faced that kept them out of the water for decades, I wanted to share their stories — as well what was important to look for when choosing an instructor and tips I have learned in the process. Around the same time a new student, Shoney, came to me. She was 54 and wanted to learn how to swim. We struck a bargain: she would write a blog about her lessons in exchange for my teaching her how to swim. Her own description of this incredible process is more accurate and heartfelt than anything I could possibly describe. The introduction is below. To read her 13-part series, go to Shoney’s Story. 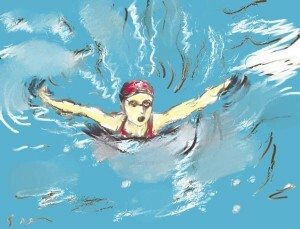 Subsequent to that, I asked other adult students to share their swimming stories. To read about these courageous and inspiring adults I’ve worked with, go to Adult Swimmers’ Stories. Swimming has been a rich and important part of my life and continues to give me great pleasure. I am honored to have inspired adults to, literally, take the plunge and learn how to swim, thereby experiencing this same gift.